personal and work files with end-to-end encryption & Swiss privacy. Using end-to-end encryption, Tresorit encrypts every file and relevant file metadata on your devices with randomly generated encryption keys. Tresorit handles data under Swiss privacy laws and stores data in the European Union to provide strong protection of personal data. With 2-Step Verification, passcode protection and remote wipe, your file in Tresorit are secure if your password or device is stolen. Tresorit Premium comes with more than enough storage space for storing all of your confidential work files and sensitive private documents. Access your files from up to 5 devices. Tresorit is available for Windows, Mac, Linux, iOS, Android and even from your browser. Access and roll back to any document’s previous versions. You won't have any lost versions ever again. Access your files wherever you are from your Windows, Mac or Linux computer, as well as from iOS, Android, Windows Phone or Blackberry smartphones or tablets. You can also login from any web browser securely. 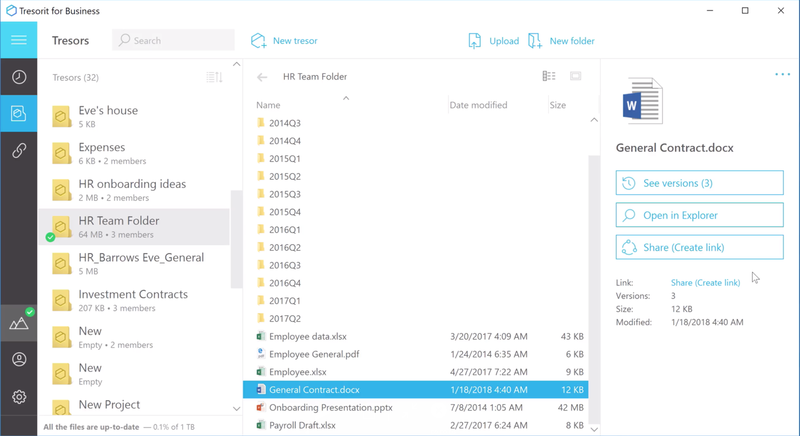 Tresorit Drive gives you access to your files and folders stored on the cloud directly through your computer’s file browser, regardless of whether they are synced or not. By enabling Tresorit Drive, there’s no need to sync and store data on a hard drive or a small SSD. This makes for a good security measure to protect your files in case of theft or hacking. Create download links to share files or folders with colleagues and friends. Keep control by setting up download limits, expiration dates, and a password for extra protection. The files can be downloaded easily from any browser, even if they don't have a Tresorit account. Tresorit's end-to-end encrypted online storage solution extends the space on your local drive and protects your files in the cloud. Keep the way you like to organize your files when you upload them to the cloud. Tresorit integrates with Finder and File Explorer. Define which subfolders you want to keep synced on your device. Keep control how much space you use on your local drive. Save your photos to a secure place and be sure you are the only who can see your favourite moments. Tresorit is the most secure way to store and share files in the cloud. No Tresorit admin, hacker or government can access the data you store. Hacking just one file would take a lifetime. Tresorit uses “end-to-end encryption” to guarantee the security of the uploaded file. Your files are encrypted before they leave your device and remain fully encrypted until they reach the recipient. Only you have the keys to open or share them. Secure services are usually a pain to use, but Tresorit's ease of use has been praised by Forbes, PCWorld and thousands of users. Our ratings on all app stores rival those of Dropbox. You can also open the Activity Wall of a tresor to see changes and, for a detailed audit trail export the Activity Wall history to a .csv file. Dropbox, Box, Google Drive and others claim that data is “safe” with them, but they don’t protect your files the way we do. They may encrypt your data but they have the encryption key and the files get decrypted on their servers every time they are accessed. Their administrators can see your files, and so can anyone who manages to gain access to their systems. Learn more how Tresorit security compares to others on Tresorit Comparison Page. Dropbox became popular years ago, when data security threats were not as prevalent as they are today. And when it comes to security, there are serious doubts about Dropbox. Using Tresorit your files will be completely secure. End-to-end encryption means you hold the keys to your data. You have total control over shared documents. Tresorit’s main difference compared to Dropbox, and other mainstream cloud storage services, is the ability to turn any folder on your device into a secure “tresor.” What this means is that you do not have to drag and drop files into a special sync folder. 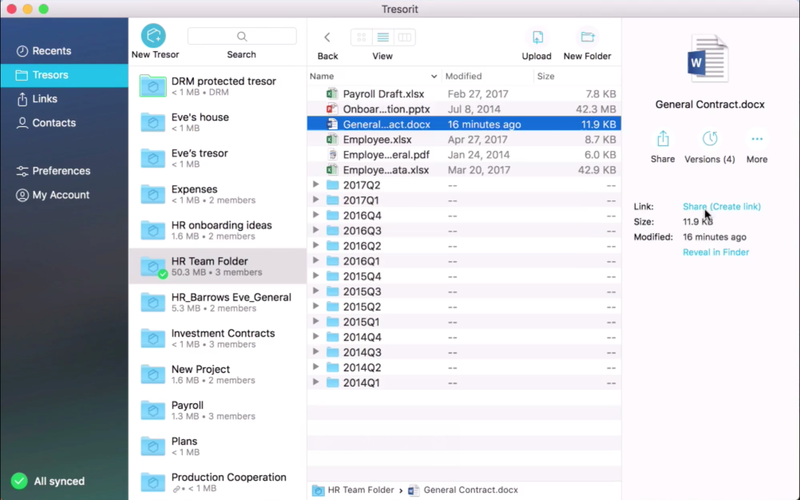 Instead, you can drag any folder from its existing location on your computer into the Tresorit app to “tresor it.” This is especially convenient if you’re digitally organized and you’d prefer not to rearrange your files into one sync-able folder. Read more about why Tresorit is the #1 secure Dropbox alternative.